Our Rustic Rhythms Windchimes bring to mind the camping trips, summer picnics and the great outdoors. 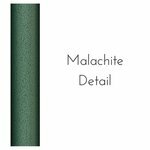 These attractive evergreen malachite color tubes will blend right in with your outdoor surroundings. The Forest Edge Windchime measures a substantial 44" long. This beautifully sounding Rustic Rhythms Forest Edge Wind Chime is handcrafted and hand tuned by an Amish craftsman. The chime top and knocker are made from poly lumber, a durable, environmentally friendly material made from recycled milk jugs. Poly lumber resists weather and does not crack or chip but still gives the same clear tones of wood knockers. The wind sail is made from aluminum to match the chimes. Powder coated aluminum is used for long-lasting colors. Powder coating bakes the color onto the aluminum, making it durable and resistant to weather. The powder coating creates rich colors and it's UV resistant so the colors won't fade in the sunlight.